Panic Away is a program for treating panic and general anxiety disorder developed by Barry McDonagh, an ex sufferer. In it he details the techniques that helped him to overcome his own panic and GAD based on 10 years of research. It comprises of a 256 page book (or eBook), videos and CDs, along with lifetime access to their private forums. At $67.99 for the digital download and $97 for the printed version it’s not exactly cheap. So is the investment worth it? On the sales page McDonagh emphasizes that it doesn’t use outdated techniques like deep breathing, positive affirmation or coping strategies. Instead, the focus is on embracing panic attacks and anxiety, rather than fighting against them. This can sound like a scary prospect for anyone that’s experienced the suffocating fear and overwhelming physical discomfort of a full blown panic attack. However, the idea behind it is that if you can embrace and observe the feelings and sensations when they occur you can reduce the mental conflict and learn not to fear them. From my own experience this is similar to when I discovered that it was negative, depressive thoughts that drove my own social anxiety. I wasn’t seeing the world for what it really was, but rather looking at it through a dark filter, where people and situations seemed menacing, raising my levels of fear and anxiety as a result. Once I knew that I was thinking about things in an inaccurate, unhelpful way I was able to start questioning my uncomfortable thoughts and feelings, which over time helped to reduce my anxiety. Another of the key principles covered in Panic Away are McDonagh’s 21-7 technique, which aims to calm panic attacks within 21 seconds, through and general anxiety within 7 minutes, and C.A.L.M. C = Community: increasing your healthy interactions with other people through getting involved in clubs and local social activities. Locking yourself away isn’t going to cure you of panic or anxiety, in all its forms. A = Acceptance: allow yourself to have panic attacks and anxiety, rather than fight against it. If you can learn to stop fearing them, and recognise they are based on unhelpful, inaccurate reactions, then you can reduce the mental conflict and their severity, until they reduce altogether. L = Lifestyle: If you’ve been suffering from panic attacks or social anxiety for a long time then you might be in the habit of staying at home and avoiding the situations that can bring on attacks. Becoming more active, through exercise, new hobbies and healthy social activities, improving your diet and living a more fulfilling lifestyle can reduce the negative thought processes that might be driving your panic attacks or anxiety. M = Meaning: Find a purpose in life and set yourself targets you want to achieve e.g. write a bucket list. Try and see your panic attacks or anxiety as a difficult period you’ve had to get through before continuing to live life how you want to live it. I personally can vouch for these principles as being important parts of my own recovery from social anxiety. For me, it was a combination of learning to recognize and challenge inaccurate thoughts, regular exercise, engaging in group activities and building the confidence to go where I wanted and to do the things I wanted without letting social anxiety get in the way. So is Panic Away worth the money? When I first visited a doctor for my social anxiety I was swiftly put on beta blockers to ‘calm me down’. There was no mention of speaking to a psychologist or learning to unwire the negative, inaccurate thoughts driving my social anxiety. After feeling like a robot for a few days, I knew medication wasnt the answer. Instead I had to look for my own solution, and thus this website was born. Panic Away certainly isn’t cheap. You might find the answers you need on other panic or anxiety related websites, along with the extensive range of books on Amazon. Joining a local support group or speaking to a therapist might also be better sources of help for you then this program. However, Panic Away might be worth considering if you want everything collected together for you, rather than spend hours hunting for answers on the internet. The videos and audio recordings might also be very helpful, if the thought of wading through books for answers sounds daunting. Panic Away is also highly recommended by ex sufferers. It’s always wise to be skeptical of these anxiety relief programs, particularly when they have such a high price tag. However, the website does provide heaps of testimonials, four of which are from doctors, along with 3000 Facebook Likes, so it’s clear Panic Away has certainly helped lots of people to reduce their panic and general anxiety. You can’t get away with fake testimonials these days, unless you want the FTC (or ASA in the UK) knocking on your door with a big fine. So I think it’s safe to say the testimonials are kosher. 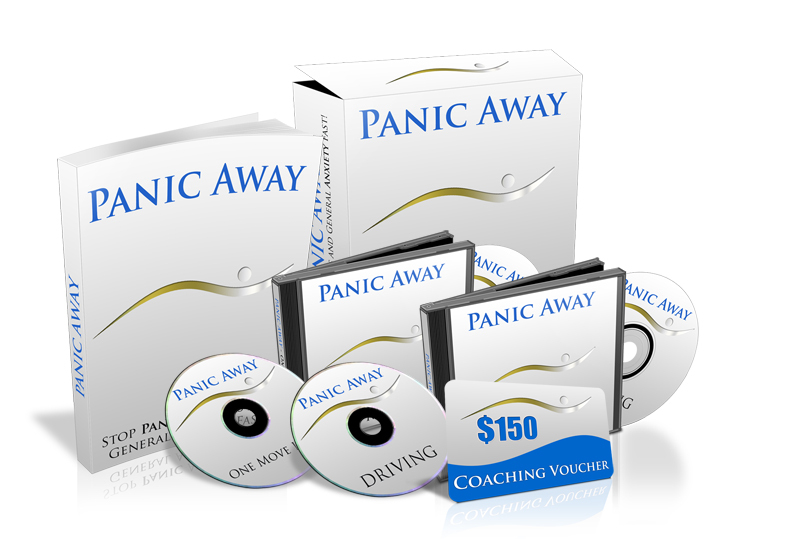 Panic Away is also sold with a 60 day money back guarantee. So if you find that it’s not for you, then you can simply ask for your money back. The website also provides a free demo of the program material, along with a free email series, so it’s worth heading over just to get all the free resources that are available.